100% Customer Satisfaction Services, Any Product Quality or Operational Questions, Feel free to connact with us, We are committed to finding the best solution for you. 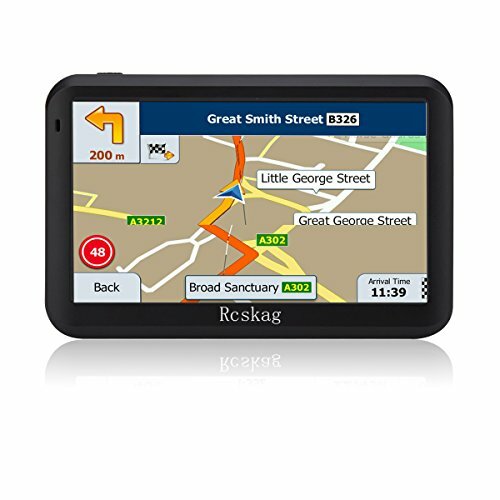 Rcskag is a brand which is keen to supply professional GPS navigation products and service.This portable GPS navigation system is one of the most popular GPS navigation,with features of portable and fast positioning,you can find your destination very easy.The most important is the maps is free updated lifetime.It's really an ideal GPS navigation system for car,truck,vehicle,biking,hiking,travel etc. Please start your car before you connect GPS to your car in order to protect the car charger and navigation. We are equipped with a new high-density lithium polymer battery and high quality car charger, all products and accessories have been 100% tested and verified, so compared with the traditional GPS devices, longer life, safety performance More excellent. Process: 2018 up to date drawing process manufacturing,Outer shape Fashion, size Moderate ,hand Feel Comfortable,Durable ! Free Lifetime Maps:keeps you map current with updates up to twice a year,If you want other countries maps,we will send you the map files and tell you how to upload. Features: Compared with general car navigation，outer shell made of unique wire drawing process and has a special feel,Durable,Can Accurate and fast positioning. Sensitive Screen:5in Touch Screen Built-in 8GB memory 480*272 TFT react fast with no delay,The color feels natural, comfortable for your eyes. 3D Navigation: select landmarks in 3D to help you place your position with the real world. It makes you easily choose exactly which lane to take before you approach an exit, turn or difficult intersection. We offer you 100% satisfaction ,If you have any questions about the product, please contact us via Amazon message. We will reply you in 24 hours ! If you have any questions about this product by Rcskag, contact us by completing and submitting the form below. If you are looking for a specif part number, please include it with your message.